This Elstead Franklin retro style industrial pendant ceiling light in gloss grey finish features a wide brimmed shade with gloss white inner and will complement a wide range of interiors. An industrial style diner pendant manufactured from steel, boasting a domed shade finished in grey, with white inner to reflect the light, matching ceiling mount and vintage black braided flex suspension. The gloss grey outer contrasts with the gloss white inner to give it an up to date look and feel. This stylish fitting will add the finishing touch to any interior and is well suited to installation over a dining table, in a living room, hallway, bedroom or landing. They look fantastic in any kitchen either singly, in a row or in multiples over a table, kitchen island or worktop. Height adjustable at the time of fitting by shortening the flex, please see below for exact dimensions. There is a matching table lamp available; please see below. 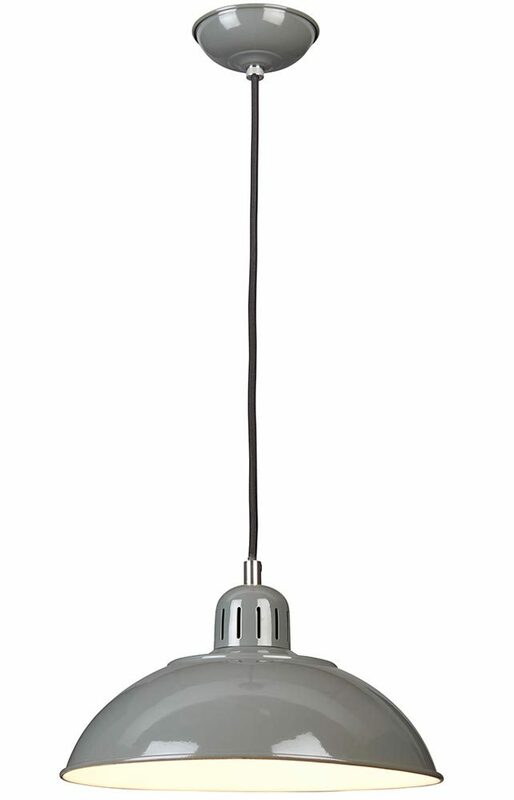 This stylish light is supplied by Elstead Lighting, a British company that specialise in the manufacture and distribution of quality decorative lighting such as the Franklin retro style industrial pendant ceiling light in gloss grey finish you see here.